Unexpectedly Most of the tracks in 'RED' are of slow tone except a folk number. Red is a Nice combination of talented young vocalists such as Jassi Gill, Prabh Gill, Ranjit Bawa, Babbal Rai and Hardy Sandhu. It is amazing to hear Hardy Sandhu and Babbal Rai in slow music tracks, I was expecting a bhangra boom from both of them. Well I would not say, any of the track leaves negative impression, All the track are good, Not extra-ordinarily good but mind pleasing. If someone asks me to choose my favorite song from the album, Surely It is "Heer Meri" by Dheera Chatha. But It won't be a deed of justice, to rate other songs down in comparison. First Track is Gal Sun Ja sung by Pav Dharia himself. Music of the track resembles with 'Imran Khan' genre songs but you cant say it is a copy of that, Vocals of Pav Dharia are flat, not spoken so quickly as Imran Khan sings. Kalle Kalle Taare Utte, Ambar main saare utte, Tera naa likha dyan by Babbal Rai is a romantic heart soothing number. 'Pyaar Mera Pahunch Gya Eho je Mukaam te' by Jassi Gill is a sweet track in impulsive speed but low tone vocals, written by Yaar Annmulle fame Babbu. Athri Jawani by Devinder Dharia is a Tradition Folk of Lal Chand Yamla Style with instruments Tumbi and Dhol, the only track which is apart from others. 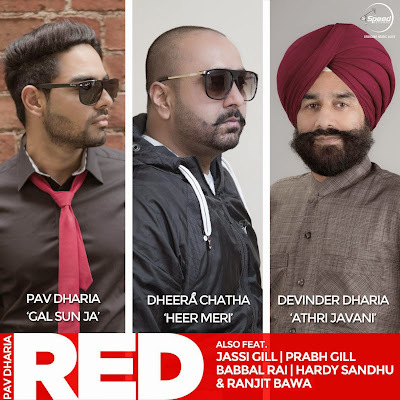 Ranjit Bawa and Dheera Chatha both have sharp voices unlike other singers in the album, so their songs looks a bit better. Heer Meri is a Song by Dheera Chatha with Prankish Exposure including some "Tappe", a new name to me but man has effective voice. Song "Saah" by Hardy Sandhu is a melodious romantic song written by Koki Deep, have been sung perfectly. Pehli Vaar by Prabh Gill seems natural becuase it is the favorite style of Prabh Gill, He used to sing with perfection. Pav Dharia has tried to impose same style on other artist. Audiance expects always some boom from singers especially Babbal Rai and Hardy Sandhu, which is totally set aside. Album looks like an experiment on all the singers, and Pav Dharia had a measure of success in this experiment.